Dr. J.L.N. Sastry hails form a traditional Ayurvedic family. He is born at Narasapuram (W.G. Dist, Andhra Pradesh) on 06-07-1965). He had school studies at Kakinada (E.G dist., A.P.) and passed B.A.M.S. in 1989 from Dr.N.R.S. Govt. Ayu. Collage, Vijayawada (A.P) in first class. he completed M.D.(Ay. ).in Dravya Guna Specialty from Dr. B.R.K.R. Govt. Ayur. Collage. Hyderabad in 1998 October. He stood first in A.P.P.S.C. selection (January 1990) and worked as med. Officer (Ayu) for Govt. of A.P. in the Indian Medicine & Homeopathy Dept, (1992-99). Between 1998-99 he acted as Research project Coordinator at the Govt. Research Dept of Ayurveda Hyderabad. He stood first at the UPSC (1998) and joined as medical officer (Ay.) in CGHS, Chenni in June 1999. The author is the recipient of two gold medals from Nagarjuna Univ. (A.P) for the merit shown during B.A.M.S. (1998). The author presented several clinical and scientific papers at Regional National and international seminars. He had more than 15 publication and scientific journals and also published several articles newspapers. Author also had given Radio-talks and given guest lectures at various prestigious institutes (both Ayurvedic & Modern Medicine). •	This is the final /fifth volume of dravyagunavijnana series written by the author. •	This volume covers vedic herbs, controversial herbs and ignored medicinal plants. •	The subject matter in each chapter is arranged in English alphabetical order for herbs. •	A glossary of Sanskrit terms and their meanings is provided at the end of the text. •	Index on Sanskrit terms and Botanical terms is provided separately to give facilitate the requirements of the readers. •	The book will help the policy makers and teachers to understood the current requirement of Dravyaguna. •	This volume will enable the PG and Ph.D scholars for selecting herbs for their dissertation/ thesis topics. •	This illustrations and botanical descriptions presented in this volume provides identification of the herbs. Earlier four volumes of this series covered the Dravyaguna syllabus as per CCIM curriculum. In fact this is the first time where a complete work is made available in English for the learners of Ayurveda. During the process, it is identified that there are few sensitive/ important issues which are not taken up by the CCIM while preparing the syllabus. For example knowledge on Vedic herbs discussion on controversial herbs important herbs in vogue (but not in syllabus) need special mentioning. 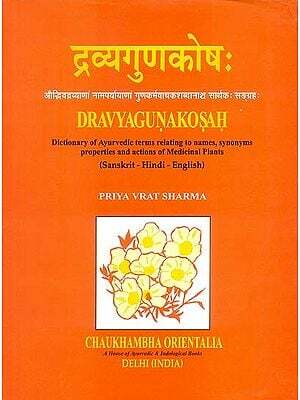 While preparing notes on second volume the author realized that the Dravyaguna syllabus (on herbs) is not based on the Ayurvedic requirement. The syllabus team might have taken books like Indian medicinal plants of Kirtikar & Basu or similar works to prepare the list of herbs. The fact that the first herbs in the syllabus is Vatsanabhi (Aconitum ferox) which belongs to RANUNCULACEAE and the last herb in the syllabus which is chatraka (Agaricus compestris) belongs to AGARICACEAE stand as a proof that they followed botanical classification. Another disheartening aspect of the syllabus us that about 55-60 herbs in the syllabus either belong to Unani or Homoeopathy system while ignoring very important Ayurvedic herbs. The missing herbs include: matsyaksi, uttamarini Jingini, kakajangha, kakanasa, kakamara, vrscikall etc. The main purpose of this volume is to enlighten the teachers and policicy makers of Ayush to understand that Dravyaguna syllabus both at U.G. and P.G. level needs reforms. The knowledge on the herbs should serve the purpose of Ayurvedic students but not the botanists. At the same time the author is not against utilization of botany or knowledge of modern science. But the base should be that of Ayurveda. There will be nothing wrong if a vaid identifies a plant as asvagandha and not as Withania somnifera. His patient is not aware whether his physician knows about SOLANACEAE family or not. But the patient is definitely concerned if the doctor does’nt know the pharmacological should actrescue of the science when identity of herb becomes doubtful in the event of two morphologically similar plants with chemical dissimilarity or therapeutic dissimilarity. Instead of burdening the BAMS student with to much of botanical knowledge let them learn more and more about properties and indications of the herbs. Similarly drug controversy should also be reduced over a period of time. On one occasion a Dravyaguna scholar proposed that “all the controverical herbs should be removed and than only betterment Ayurveda is possible”. For this author relied that- led us remove the controversy’ not the controversial herbs. This is because a controversial herbs still posses an important pharmacological property. For example whether Chlorophytum sps or Asparagus sps, which ever is used as Safed musli, both have their own therapeutic benefits. If possible, the controversy to be excluded but not the herbs. By removing the controversy we can have two herbs instead of one. If we need to identify three herbs as pasanabbedi (viz; Rotolla aquatica, Aerva lanata & Berginia ligulata), there is no harm. The important factor is that all the three should exhibit lithotriptic property. This volume will definitely enlighten the students and teachers on several important aspects related to Vedic herbs missing herbs and controversial herbs. My Co-Scholar and reputed Dravyaguna teacher Dr.B.S. Sawant is specially thanked for endeour to finished this series successfully.